If you have decided to go for the 20s vintage styled wedding gown there is an entire collection of 1920’s wedding dresses displayed at antiquedress.com to get inspired from. Many of these dresses are already sold, so if you would want to buy the one that you like, there are poor chances to find it available. Although they come at pretty expensive prices, you will be surprised to find out how many of them have been acquired, and not only for wedding occasion, but some of them being more suitable as well as collectible piece of garment. Nevertheless, your 1920’s wedding dress can greatly find its inspiration if you browse through these styles and go for the design that appeals you the most. We have some of these gowns that are quite astonishing for the vintage style of your wedding apparel. Be aware that all of them are made of intricate fabrics, but nowadays you can find almost any type of fabric that was produced back then in the 20s, so it shouldn’t be a concern for you. * An Edwardian styled gown that can inspire your1920’s wedding dress. It is made of white cotton batiste with gauze fishtail train. The uniqueness of this dress relies more on the way the dress is cut at the back side with draping that gathers at the lower part of the back in an oval shape creating the appearance of a fishtail train. Tiny silk flowers decorating the oval and the front side of the bodice. * The Pannier dress colored in platinum gray and made of silk satin and lace. 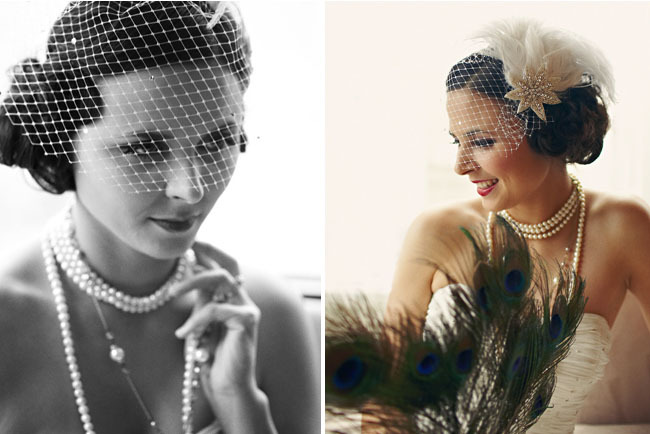 It is for a less conventional style being a great inspiration for your 1920’s wedding dress. Matching silk lace scarves decorate the front and back of the skirt and wax flower decorating at front the waistline in the middle. The round neckline and sleeveless bodice makes this style very suitable for whimsical brides. * Again a dress that goes very well for a casual summer wedding and being a great source of inspiration in creating your 1920’s wedding dress. It is colored in soft pink and made of chiffon with a beaded flapper overlaying the sleeveless bodice. It has beadwork in rhinestones at the zigzagged flapper detail, the same beads continuing in a wide beaded stripe on the skirt right where the zigzag of the flapper ends.